Happy New Year! It’s been awhile since I’ve had a chance to blog and so much has happened since I did! Our little boy arrived into the world just over six weeks ago. I am loving being a Mum. I know it’s mushy, but when I wake up to smiles from my little one, I can’t help but have a good day. Of course, there are challenges that come along with having a new baby in the house, but we get through them. I’m slowly adjusting to weird sleeping patterns and having very little time to myself (sometimes my big achievement for the day is having a shower!) but in the end, our little one is healthy, happy and surrounded by a family that loves him. What more could I ask for?!? Anyway, the reason for my post is not to get all mushy on you, but to finally get back to sharing some kawaii with you. I was very lucky and thanks to a lot of influence from my hubby, I had a very kawaii Christmas. Wasn’t I spoilt? And this doesn’t include the kawaii gifts my hubby gave me himself…but I will save them for another post. I’ve wanted the Winnie the Pooh letter set since it first came out so I was immensely happy to find it amongst my Christmas gifts. 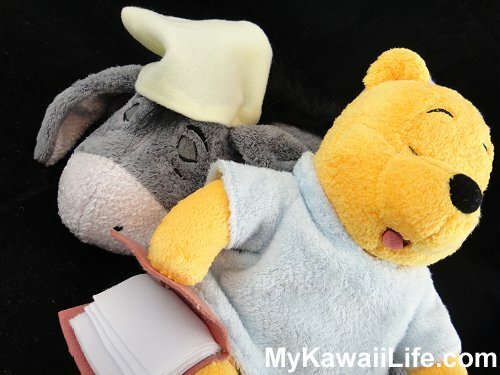 Of course, I love them all, but I am particularly fond of the Pooh letter set and the Daisy letter set. I’ve been wishing for the White Animal Zoo series for ages. There are actually four in the set (my hubby gave me the fourth one). I love the other two sets too. 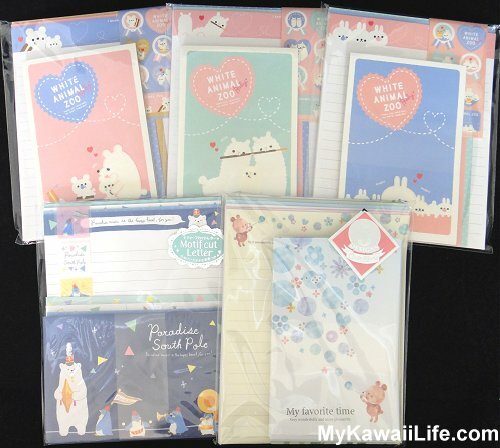 I can’t help but adore kawaii bears and penguins! The next collection of letter sets came from my Mother-In-Law and Father-In-Law. I can’t pick a favourite amongst these. They are all so cute. I do seem to have a new attraction towards kawaii birds though and especially love the bird cage set. My Sister-In-Law steered away from letter sets but gave me the new Sentimental Circus series from San-X. I am sooooo happy! I adore Sentimental Circus and the Red Riding Hood range is probably my new favourite. She gave me the new memos, mini memos and a notebook. Now I just have to find a special use for the notebook. Finally, my Mum also found a collection of gel pens for me. She knows how much I love to use them for my penpalling and crafts. Some of them are glitter, some are metallic and some are neon. I’m definitely going to have some fun with these! I hope you’ve enjoyed this sneak peak at my Christmas gifts. I am very grateful to have family that spoil me so much and who go to the effort of finding gifts I truly love. I can hear my little one calling now, so I must sign off, but I will try to post more pictures soon! 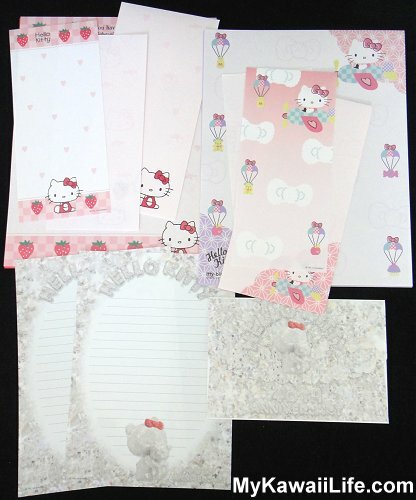 I adore Hello Kitty regional stationery. It’s not easy (or cheap) to find, but I love it and think it is definitely worth the effort to search for it! 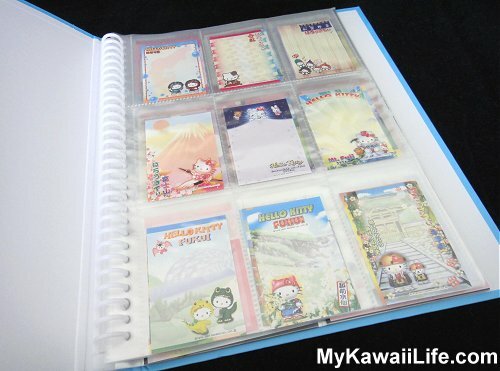 So, you can imagine how excited I was when I received this amazing swap in the mail – a folder full of Sanrio memos, including lots of regional Hello Kitty memos from my new friend in Japan! Unfortunately, I can’t possibly show you every single memo she sent (there are too many), but hopefully you will enjoy these highlights. I especially love the one from Fukui in the bottom left corner. Could Hello Kitty dinosaurs be any cuter? My favourites are the Little Twin Stars memos. I adore this particular range. Now I just have to track down the bigger memos and the letter sets. I missed most of this collection when it came out in 2010, so I’m very happy to have some mini memos. 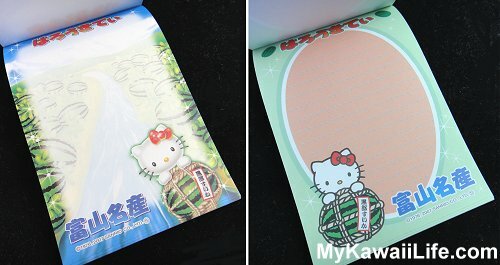 The final page I want to share with you is another page of regional Hello Kitty memos. These ones are a little bigger than mini memos, but not quite as big as regular memos. How cute are the sea life ones!?! Thank you so much for this amazing swap…especially the Hello Kitty regional memos! 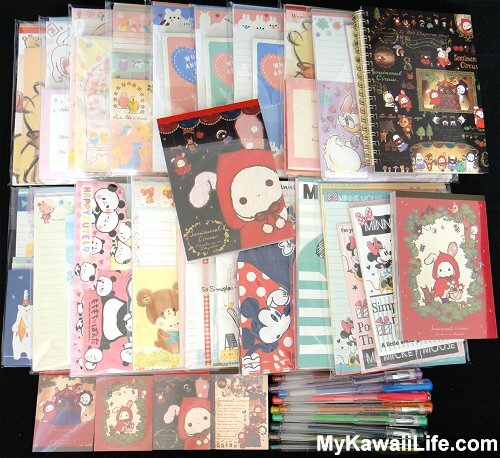 I hope you like all the Sanrio goodies I am sending in exchange. Today I needed a bit of a de-stress, so I thought I might put away my latest Disney sticker sacks. I got these from various sources over the past month or so. And I just thought they were so cute that I had to share them with you. I’ve actually been looking for the sack on the right for over a year now as I just love its vintage style. I was so happy to finally find it and was pleasantly surprised to discover there were other sacks in the series as well. I wonder if I’ve missed any others! The fourth sack was released by Kamio. 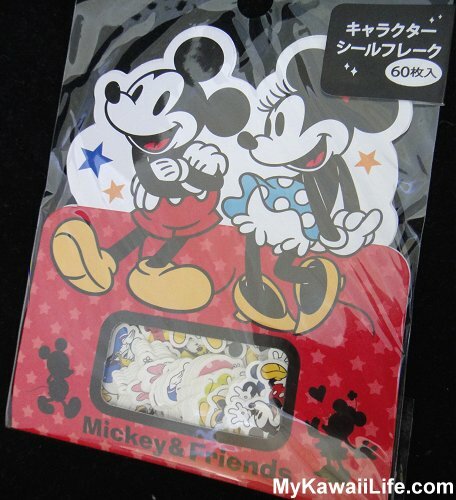 I always love Kamio’s Disney sticker sacks and this one is no exception. The sticker flakes themselves are a little smaller than I had expected, but still super cute! The final two sticker sacks come from another Japanese company called Ensky. They often seem to release packets of ‘mini stickers’ but finding them is extremely difficult. I’m sure I’ve missed loads of them! 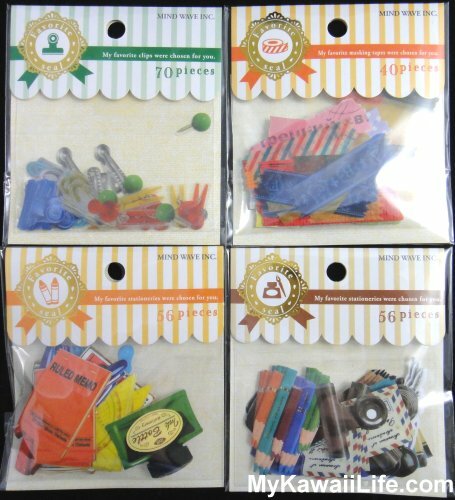 I love Ensky sticker sacks, but unfortunately, they are quite expensive (usually around 300Y). Each sack usually contains between around 20 and 35 designs but only one of each. Still, who can resist Frozen sticker flakes, right? I love these new additions to my Disney sticker flakes collection and sorting through them today has certainly put me in a better mood. I hope you’ve enjoyed looking at them too. 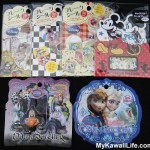 If you do like these Disney sticker sacks, I’d appreciate it if you could please pin them to Pinterest. Thank you! 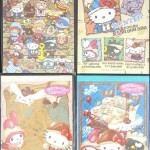 I recently received an adorable Sanrio Hello Kitty package from my wonderful friend, Carla. She really spoilt me this one! 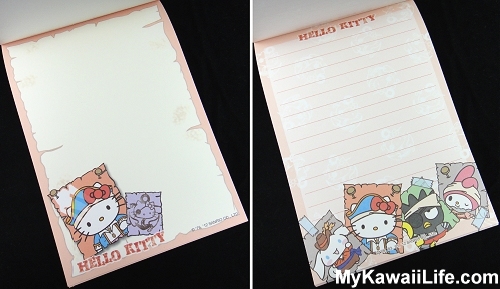 Inside was a set of Hello Kitty Laduree stickers, a regional Hello Kitty memo pad and a cute Hello Kitty card. 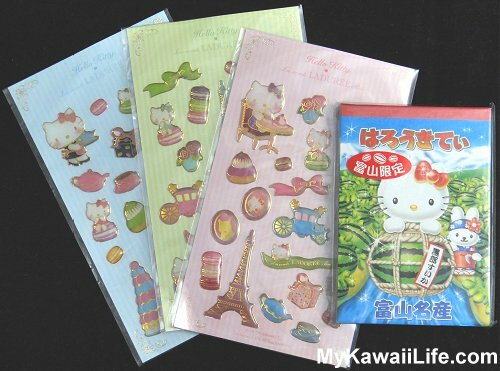 The Hello Kitty Laduree stickers are adorable. They were released by Laduree under license from Sanrio. They are epoxy stickers accented with gold. As far as I know, you can only get them in Japan. They are dated 2011. I love them and am very grateful to have a set for my collection. The pink one is probably my favourite, but I keep changing my mind. 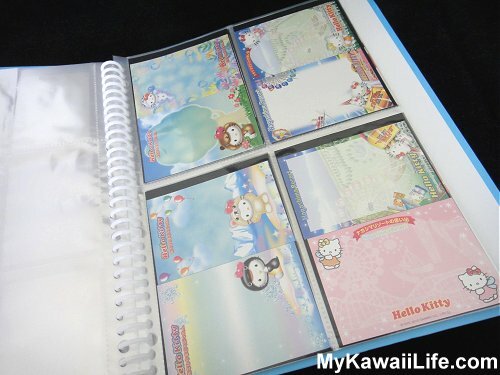 Also in the package was a regional Hello Kitty memo pad dated 2007. Again, these are only available in Japan. 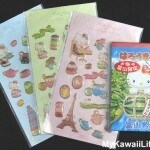 Carla knows how much I love Hello Kitty regional items! I don’t know why, but I also have a soft spot for fruit themed items, so of course, I love the watermelon theme. 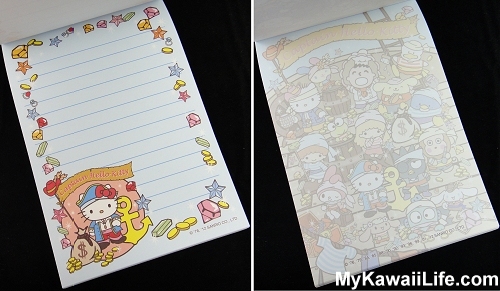 The picture shows the two designs inside the memo pad. They are both cute, but I like the one on the left best. 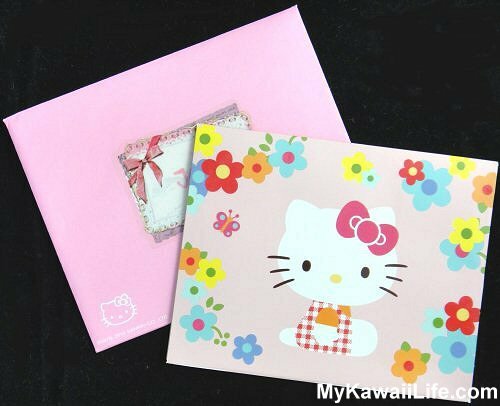 It’s actually a pop-up card featuring a cute Hello Kitty garden scene inside. Thank you so much Carla! I feel very spoilt! 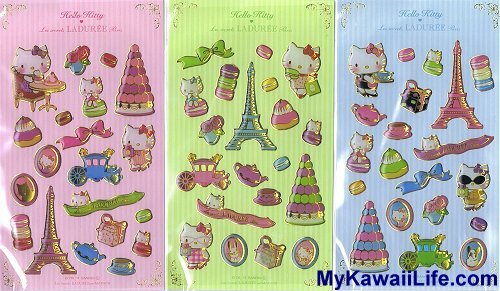 If you like these Sanrio Hello Kitty pictures, especially the Hello Kitty Laduree stickers, please pin them to Pinterest. 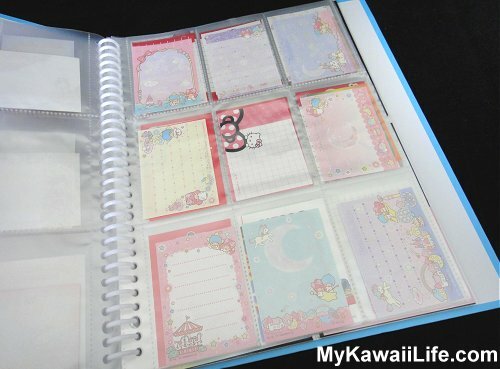 Lately, I have been sorting and organising my kawaii sticker flakes collection. And believe me, it was about time! Everything was a mess and I had completely lost track of what I had. The only problem is, whenever I go through my sticker flakes, I have this really bad habit of buying more. I guess it’s inevitable! Lol. Today I thought I would share a few of my new sticker sacks with you. 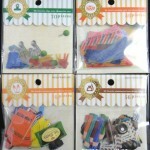 They are from Mind Wave’s ‘Favorite’ series of sticker sacks. The first four follow a stationery theme. It’s hard to choose a favourite, but I think I like the top two best. 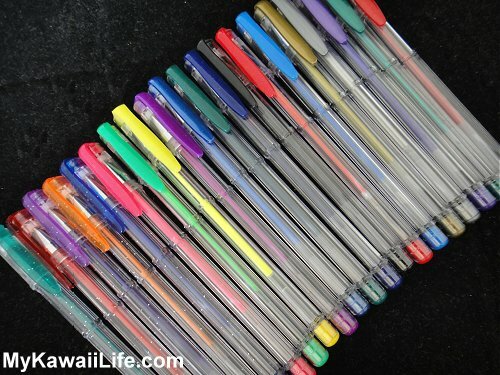 They look more fun to use for decorating pen pal letters. The clip stickers (top left) are a little on the small side though. 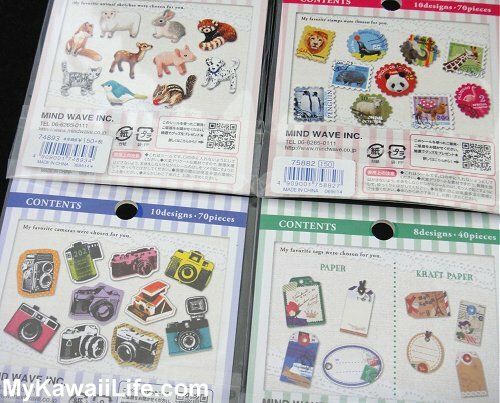 My favourite is definitely the animal stamps. Who doesn’t like stickers that look like postage stamps! I do love the little bunny rabbit sticker flake in the animal sketches sack too. These are just a handful of my new sticker sacks. As I get more organised, I will share some more of them with you. 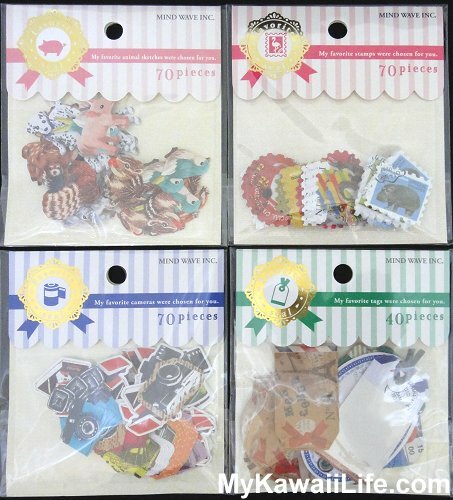 If you collect sticker flakes and ever want to swap with me, I’d love to hear from you. Just send me a message through the Contact link above. Thank you. I am very sorry for my unexplained loooooong absence. I’ve missed blogging incredibly, but my life took an unexpected turn towards the start of this year and I’m afraid blogging had to take a back seat for awhile. Don’t worry though, the reason behind my silence is wonderful! I am expecting our first child. My husband and I are absolutely over the moon. We are so excited! I have been very fortunate with my pregnancy too. I didn’t have morning sickness (just some indigestion) and everything has been going smoothly. The only real issue I have had is extreme tiredness. I slept through a lot of my first trimester. Once I entered the second trimester, things improved, but I am still tired all the time. That’s my main reason for not blogging for so long. I have found that I have missed blogging enormously though, so I am going to try to get back to it this month. I am not sure how often I will be able to blog or what will happen once baby arrives, but I hope I will not have to let months go by without an entry. I guess I’ll just have to wait and see how things go. 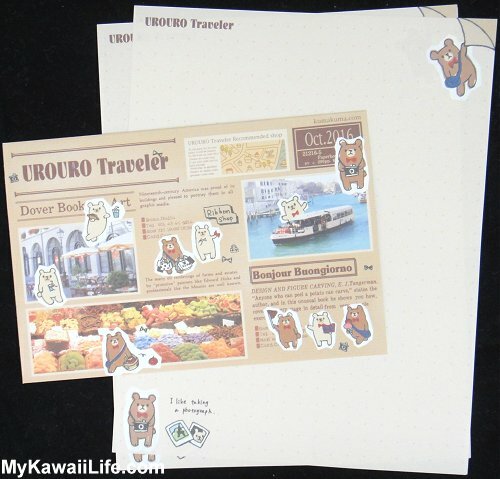 I found these Urouro Traveler letter sets in Japan last year and just thought they were adorable. 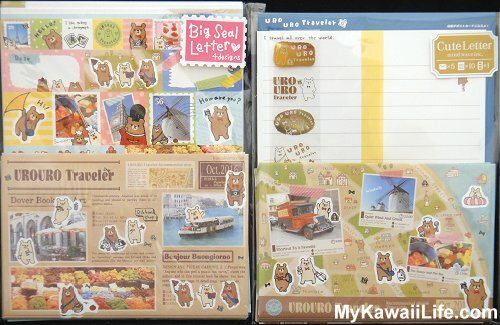 They combine two of my favourite things – cute kawaii bears and travelling. Urouro apparently means ‘to wander aimlessly.’ I love this idea. When we travel, we love to have plenty of time to just wander around and explore our location without a set timetable. 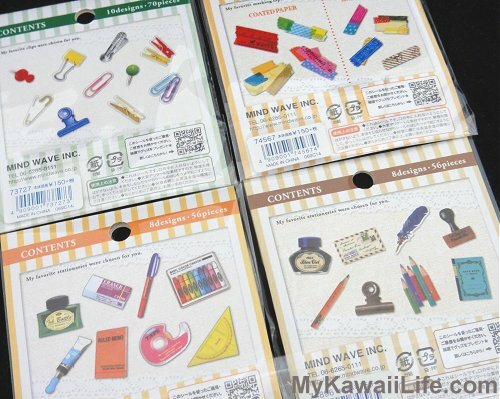 Both letter sets were released by popular kawaii brand, Mind Wave. The letter set on the left features four different designs while the letter set on the left is a single design set. I love the map theme and the cute little north / south image in the top right corner. 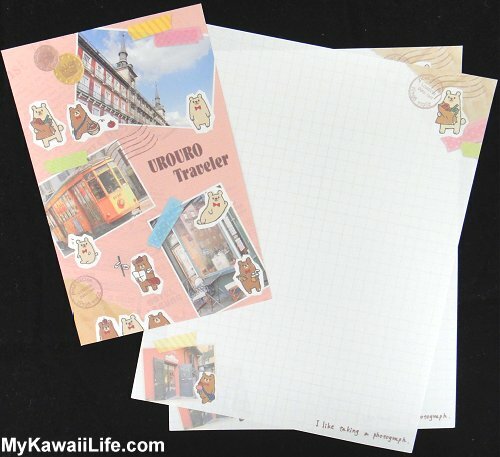 It looks a little like a scrapbook or travel journal with images of photos supposedly taped on with washi tape. I like how the paper has a grid pattern too, instead of the regular straight lines. I particularly like the envelope from this design and the different shaped stamps scattered around its edges. 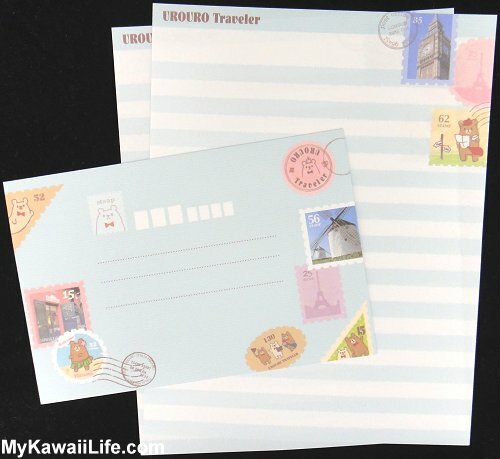 The last design from the large Urouro Traveler letter set focuses on being a tourist. It features a cute little bear with his camera going out and seeing the sights. I love the hula dancing bears! Lol. I don’t think I’ll ever be able to bring myself to use these stickers. They are just too cute! I haven’t actually opened the single design Urouro Traveler letter set, but as you can see, it follows a very similar theme to the others. 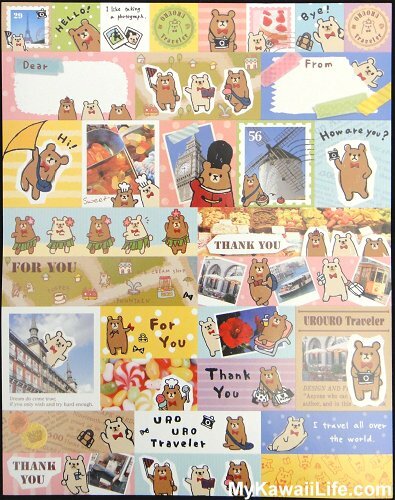 The envelope features a map motif, while the paper features three cute little bears at the bottom and the cute north / south image at the top. I hope Mind Wave will release some more items featuring this theme. 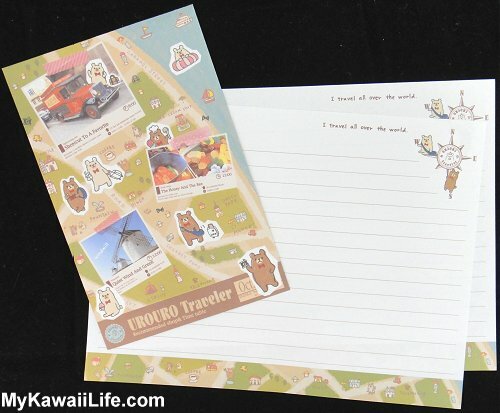 I’d particularly love to find some Urouro Traveler stickers…or perhaps even some more Urouro Traveler letter sets. Did you know Hello Kitty has gone rogue? Well, at least for the Captain Hello Kitty range she has. 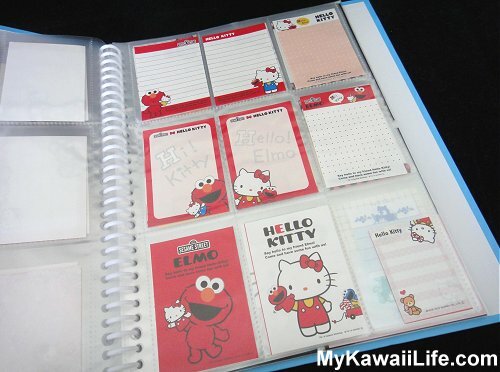 I fell in love with these Captain Hello Kitty memo pads as soon as I saw them. I mean, have you ever seen cuter pirates! 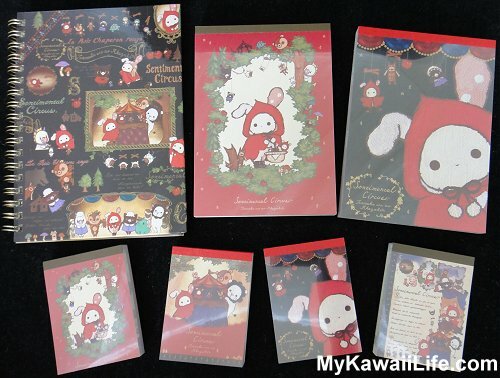 I believe these memo pads were only ever released at Sanrio Puroland in Tokyo, Japan in 2012. Not only do I think they are adorable, but I love how so many characters have been incorporated into the designs. And My Melody makes a great first mate! 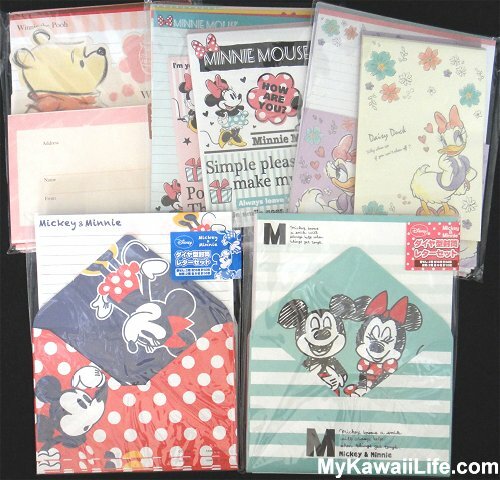 Each memo pad has two different designs inside. 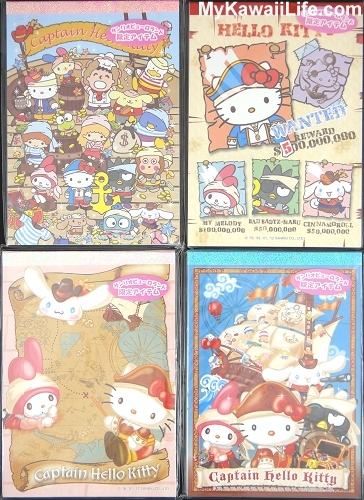 The first features Captain Hello Kitty with her treasure on one design and the whole pirate crew on the other. 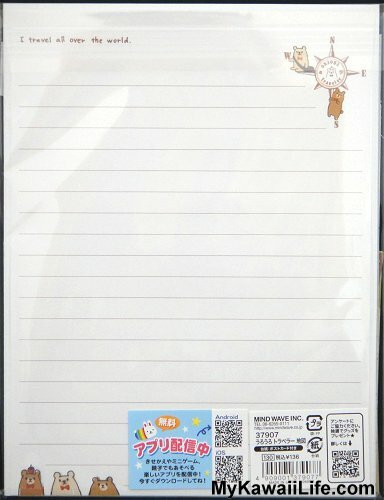 On the third memo pad, Captain Hello Kitty has a treasure map which, based on the designs inside, appears to lead to a huge yellow gemstone. 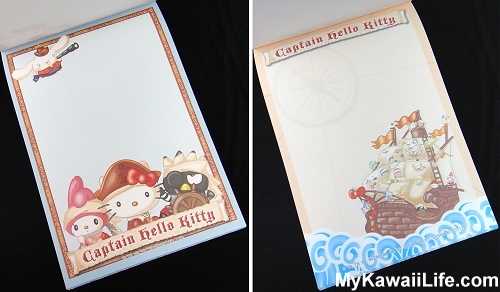 The final memo pad features Captain Hello Kitty, her crew and her pirate ship. If you look closely, you can see her Sanrio crew scattered all over the ship and Cinnamoroll playing look out. 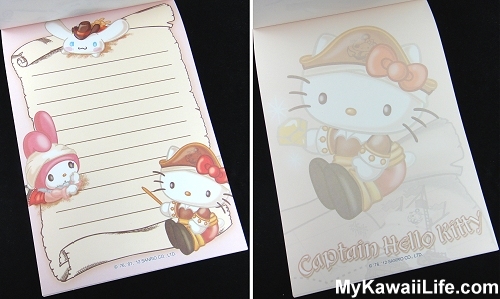 Do you have a favourite Captain Hello Kitty memo pad? I can’t decide. I love them all! I just wish they made letter sets with this design! If you love them too, I’d really appreciate it if you would pin them to Pinterest. Thank you so much! I have quite a few Rilakkuma sticker flakes in my collection. 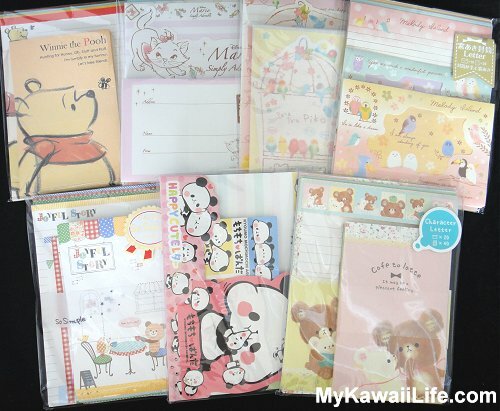 Most of them are the common ones – Rilakkuma and strawberries, Rilakkuma bath time etc. 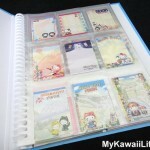 I thought though that you might like to see some of the rarer Rilakkuma sticker sacks in my collection. 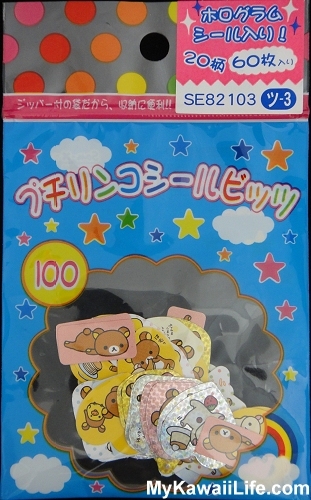 The first is a standard Rilakkuma sticker sack released by San-X in 2004. I haven’t actually opened it, but I believe there are 20 different designs inside. The next two sticker sacks aren’t as old. The one on the left was released under license by Sun Hing Toys in Hong Kong and I think the one on the right was given away with a magazine in 2010. 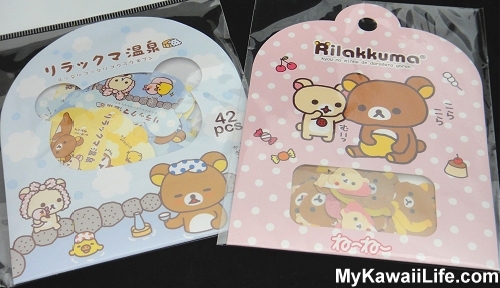 All the flakes in the one on the right are the same shape – the shape of Rilakkuma’s head. They are a bit like Mickey Mouse ears, but the face is wider to look more like a bear. There are different scenes printed on each flake. It’s a little hard to tell what the designs are in the pink sticker sack as again, I haven’t opened it. 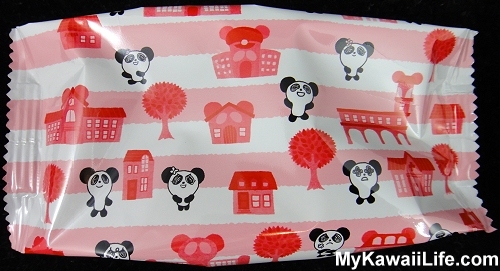 I believe there are ten different designs though and many seem to feature Rilakkuma or Korilakkuma with a blanket. I think this next sticker sack was also given away with a magazine. It is dated 2011 and comes with a fold-out cardboard box. 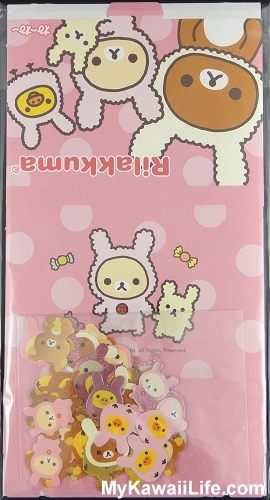 This is one of my favourite Rilakkuma sticker sacks as I love it when Rilakkuma and his friends are given bunny ears. They are just too cute! 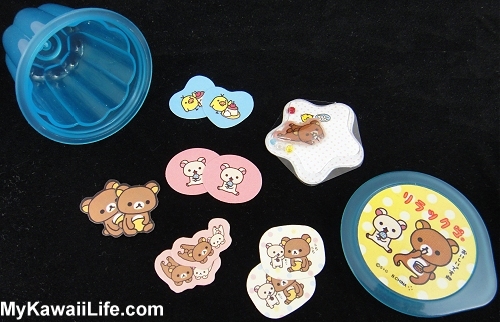 The next sticker sack is actually a cute little Rilakkuma tin with sticker flakes inside. 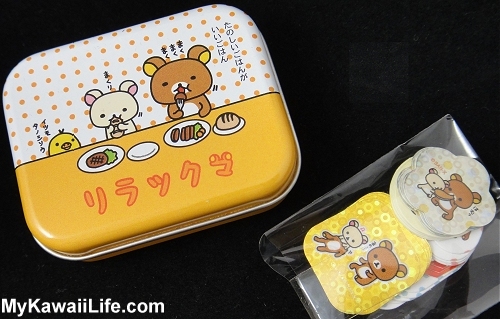 The tin features Rilakkuma and his friends enjoying a meal. There appears to be six different designs of sticker flakes inside (two of them are shiny). Some appear to follow the theme of the tin, but others do not. There is no date on the tin, so I am not sure when it was released. I quite like sticker flakes coming in little tins, but I’m not sure what I think of them coming in jelly cups. 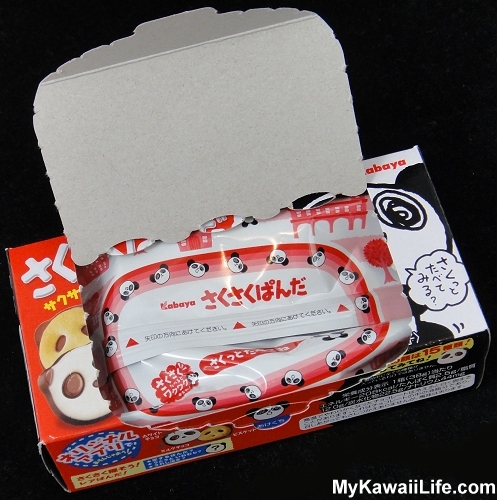 While the stickers inside look really cute, I can’t look at them closely without completely ruining the packaging. I am not sure if I will ever open these. I’m not sure when or where they were released either. I do have one jelly cup I can open though as it has a proper lid. 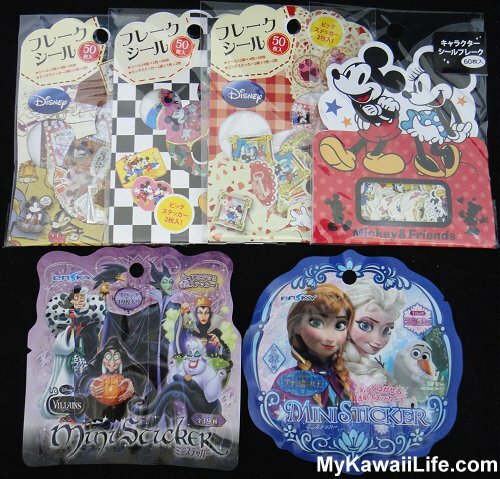 There are five different sticker flakes designs inside (two of each) as well as a big plastic sticker. They are not dated, so I am not sure when they were released either. I’m very lucky to have found these Rilakkuma sticker sacks over the years. All of them came from collectors down sizing their collections. I wonder how many more I am still missing from my collection. 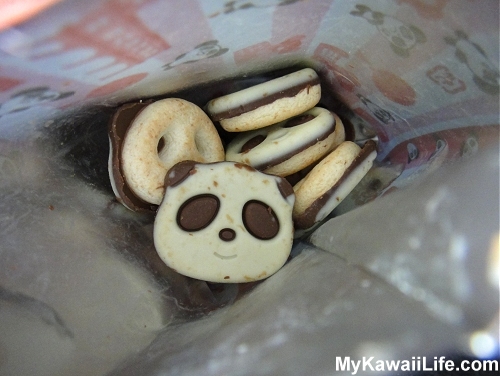 These adorable kawaii panda cookies are another of the cute snacks I brought back from Japan last year. 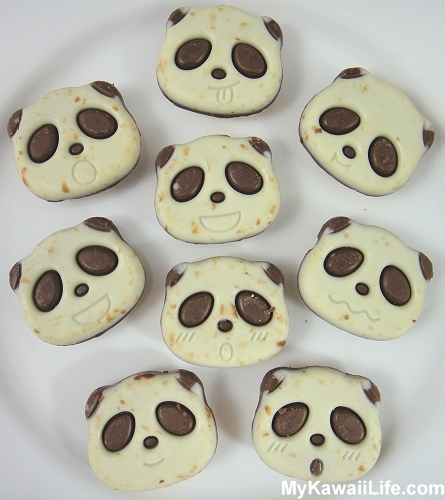 Up until now, I thought they were just too cute to eat. But, since they were approaching their expiry date, I thought it was time to open them up. 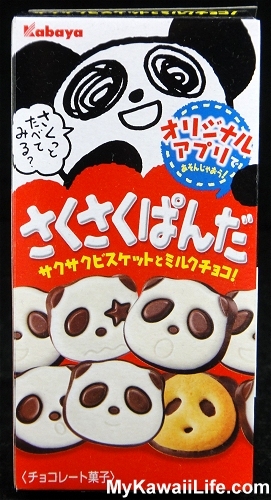 As you can see from the box, the cookies inside look like pandas with different expressions on their faces. The back of the box shows more of the expressions you might find inside. 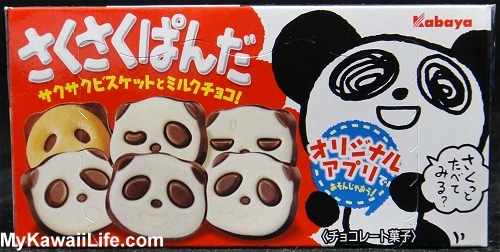 When I finally opened up the box, I found even more pandas staring back at me! The packaging I saw when I first opened the box was actually the back of the plastic bag containing the cookies. The front is even cuter! I love the panda buildings! Finally, we get to the sweet stuff inside…the actual cookies themselves. This is what was looking up at me when I opened up the bag. This is just me playing around with them for a cute photo. Lol. These are all the expressions I got in my packet. Sadly I didn’t get all of them. I had hoped for some with the star eyes, but unfortunately, it was not to be. Maybe next time! The back of each cookie is just as cute as the front. This is where you can see the actual cookie component. 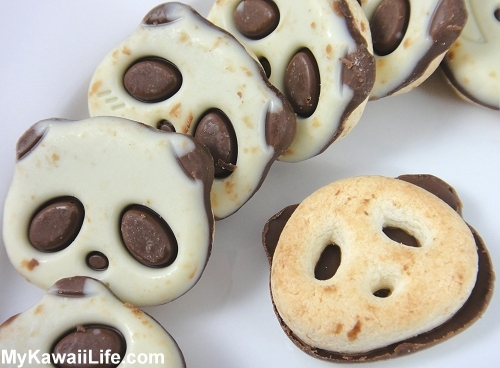 These panda cookies aren’t just cute…they taste delicious too. I really like the cookie part. The chocolate is pretty weak, but standard for most cheap chocolate snacks from Japan. I don’t think they use much cocoa. The chocolate is much creamier than chocolate I would buy here and not as sweet. 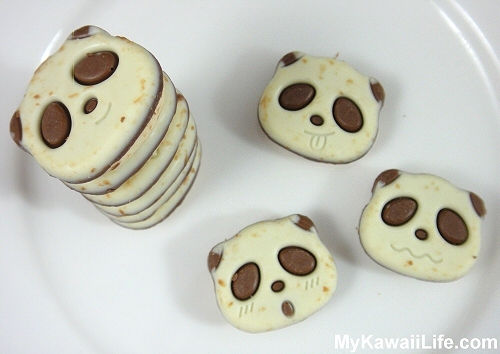 I probably wouldn’t like the chocolate on it’s own, but it goes really well with the cookie. 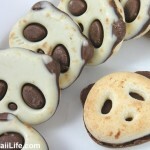 If you ever get a chance to try these panda cookies, I recommend them. I think you can even get pink and white ones with a hint of strawberry flavouring. Yum!